The latest update for Total Network Inventory 3 is out. As we promised, it’s the reworked Active Directory synchronization module. 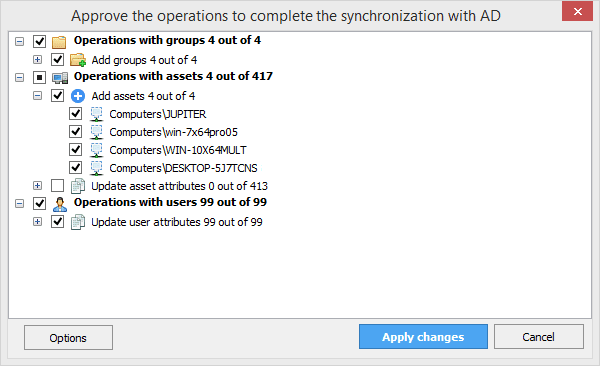 The synchronization process becomes more convenient and informative, and more tweaks can be made. NewAbility to synchronize computers and users with a different domain. NewAuto-picking passwords for logging into the domain during AD sync. NewA window with preliminary results allowing to view and control the synchronization (when launching manually). NewSynchronization results are logged to a text file. NewAbility to schedule synchronization with AD. ImprovedCorrect handling of renamed devices during synchronization. ImprovedDetection of the current and root domains at startup. ImprovedThe process of automatic synchronization at startup and on a schedule is invisible to the user. + Some other fixes and improvements. As you probably know, synchronization with AD could only be initiated manually or when the program itself is started. Yes, we agree with you that this is sometimes not enough. And that’s why a new method was added: automatic synchronization on a schedule. Simply set up the Scheduler, and the program will synchronize with AD exactly when it suits you! We’d like to point out that synchronization at startup will be disabled after you update. But worry not, you can either enable this setting again, or switch to only using the Scheduler. In this window, you can browse the proposed changes and choose what elements should be updated. Don’t want to move devices? Uncheck it. Want to update information for specific computers? Select only those. Synchronize users only? Easy. All done quickly and conveniently. Another new helpful feature is trying different logins for AD. If TNI fails to start the synchronization using the current user’s credentials, the program will automatically try to find the correct login from among those listed on the Edit – All logins tab. And another thing we ought to highlight: now it’s possible to synchronize with a domain that the current computer does not belong to. Update your TNI and enjoy the new features. See you next time! We have TNI 2 Licence for 350 nodes from 2012. How is the cost and the procedure to upgrade it to version 3.4.x? Thank you for trusting our product. You can also check the renewal price there. Hi – when do you think you will have SFTP transfer from the Resident Agent and transfer triggered on detection of an internet connection? These features are currently holing us back from deploying. We have increased the priority for this task. However, the actual release date for this update is still unknown. We are planning to improve the AD Sync section of our TNI manual in the future. We hope that it will become much more informative and user friendly. Not sure about the Youtube video, but we’ll pass your request to our management.